If you’ve been paying attention, you will have noticed that I like to play around with recipes and make up new things… especially out of old things. So when my wife made a Perfect Roast Chicken (which I WISH I could take credit for), I saw the leftover carcass not as a steaming pile of bird bones, but as an opportunity to create something delicious in the future. To the momentary horror of my wife, I froze the leftovers (grease, bones, garlic, fennel and all) and began the process of mental recipe construction. It stood to reason that my frozen tub-o-carcass would make a great stock. So the other day I loaded the leftovers into the stock pot, topped it off with three pounds of frozen chicken breast, a couple cups of water, and let the whole mess simmer into golden delectability for about two hours. 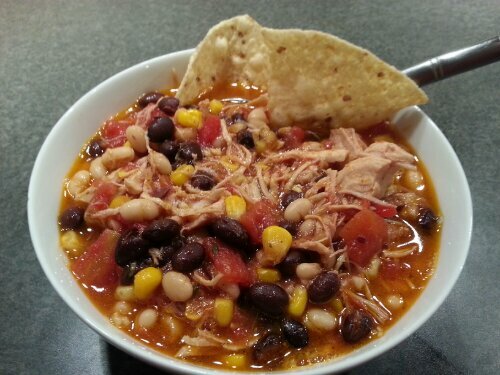 While I had originally intended to make a traditional chicken soup, a simple request from the missus turned it into a version of tortilla soup. I strained the simmered stock slowly through a sieve (five-times-fast?) an removed the pieces of flaking breast to add back into the soup, and set it aside. Meanwhile, I sautéed three cloves of garlic and two chipotle chiles in adobo (chopped fine) in the same stock pot for about 3 minutes. 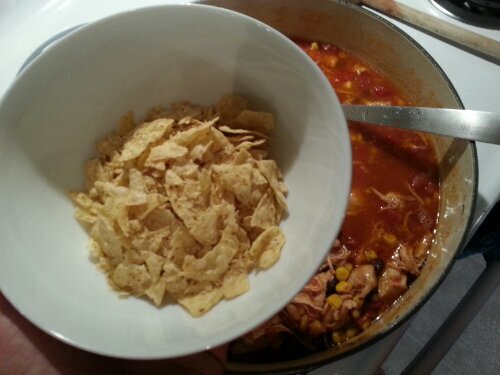 I then added a can of diced tomatoes, a pinch of salt and pepper, a can of corn, the stock and the chicken, and returned the mixture to a simmer. After a short simmer (about 10 minutes) I finished with a can each of white and black beans, which I had strained and rinsed before mixing them in. Another 5-10 minutes and some slow stirring allowed all of the ingredients to mesh into a wonderfully savory soup! The final steps? Serve over a handful of crunched-up tortilla chips with a squeeze of lime to impart that final citrusy zing! Previous Entry Cold Weather? Grilled Pizza!